James F. Schweitzer is an Assistant Professor in the School of Health Sciences at Purdue University in West Lafayette, Indiana. He received a B.S. in Biology from Randolph-Macon College, a M.S. in Health Physics and a Ph.D. in Environmental Toxicology from Purdue University. 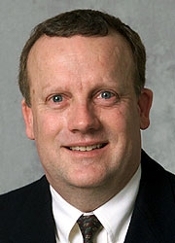 He has been Radiation Safety Officer at Purdue University since 1987 and has served as Director of Radiological and Environmental Management since 2001. He teaches courses in applied health physics. Radiological and Environmental Management serves as a principal site for undergraduate internships in health physics and industrial hygiene and as a practicum site for health physics graduate students. He is a Certified Health Physicist and is active in the Hoosier Chapter of the Health Physics Society and other professional societies. He is married to his wife, Pam (retired from Purdue) and has one adult son.